I remember being about 11 years old and playing Gold Medal Challenge ’92 on my Nintendo. Between games, they would break in and talk about your country’s marathon runner, their current place, and pace. I remember thinking “Wow. That is something I will never be able to do. 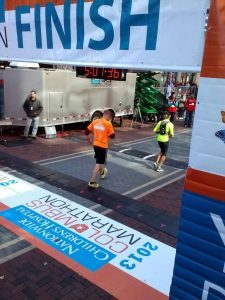 You would have to be a super hero to do that!” Well, last week I proved that theory incorrect when I crossed the finish line at the 2013 Nationwide Children’s Hospital Columbus Marathon and became a marathoner! At the end of my training, I started to believe that I would crush the marathon. 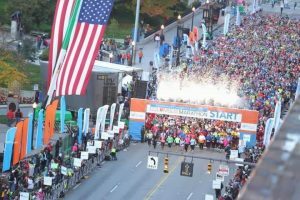 On race day, I quickly realized that running down the Olentangy trail for 20 miles for a few Saturdays barely prepared me for what I faced on the course. I greatly underestimated the effort it took to complete a marathon. Although I didn’t meet my optimistic time goal of 4:20, I did come in under 5 hours at 4:50:34 (Detailed Results). This made me extremely happy. Most importantly I finished and survived! I will remember my first marathon as one of the most incredible personal experiences of my life, ranking just behind marrying my beautiful wife, Terri, and the birth of my daughter, Zoe. 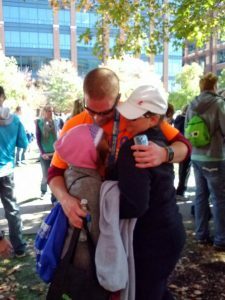 The marathon experience was made even more rewarding with being a Children’s Champion for the Nationwide Children’s Hospital. 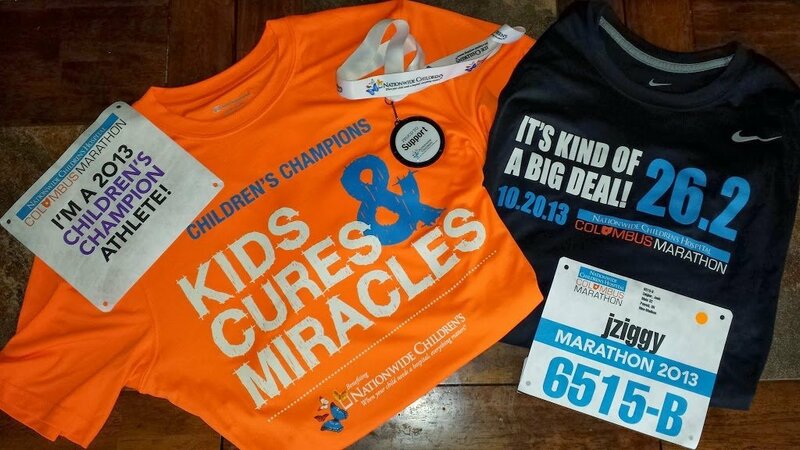 The Children’s Champions program gave marathon participants the ability to fundraise for the Nationwide Children’s Hospital Foundation. My fundraiser raised $1,025 for the foundation and my company, Cardinal Health, will be matching those funds through our Giving 365 program! Together, Children’s Champions raised over $220,000! The Nationwide Children’s Hospital has a very special place in my heart for the care that they have provided to my daughter. Almost 3 years ago, she was diagnosed with a blood disease called Idiopathic Thrombocytopenic Purpura or ITP. For some unknown reason, Zoe’s body is destroying her platelets. The symptoms of this can include bruising and petechiae, as well as external or internal bleeding. Fortunately, Zoe has responded well to treatment and even went into remission for over a year and a half. In March 2012, we tried a new treatment and unfortunately Zoe’s body rejected it. She contracted serum sickness as her body was trying to fight against the treatment and landed her in the hospital for a week in excruciating pain. The doctor’s, nurses, and staff at the Nationwide Hospital have taken incredible care of Zoe, even through treating a disease with very little information or treatment options. So needless to say, being a Children’s Champion was a very special experience for me. I was even more humbled by the generosity and support of my friends, family, and coworkers. When I signed up, I was nervous about setting my goal at $1000. I was thinking that there was no way possible that I would hit that goal. I even thought about lowering the goal at one point. But much to my surprise, I exceeded the goal by $25! I had over 25 separate generous donations over the span of 10 weeks. The day before the marathon I was surprisingly calm. I completed a short 2 mile stretch run, but for the most part I tried my best to keep my physical activity to a minimum. The wife and I made a trip downtown to the Expo for packet pickup and did a little shopping for clothing to wear. Outside of that, it was a rest and relaxation kind of day. Sleeping the night before was short but deep. Waking up at 4am was a little rough for me as I am not much of a morning person. Slow moving, I drank my coffee and ate my traditional bowl of Honey Bunches of Oats. I was quietly anxious as my wife and I made our way downtown. I planned on visiting the Children’s Champions VIP tent for breakfast before the race for my last round of fuel, so I didn’t over do breakfast at home. Unfortunately, the wife and I searched for the Children’s Champions tent and could not find it. I overly counted on that pre-race breakfast. My hunger increased as we gave up the search and made our way to the corral. Lesson learned: deal with your own food before the race. Although I was assigned to Corral B, I held back into C with the wife. Jennifer made her way over to keep us company until the start and the three of us hopped around to keep warm for an hour. Sadly, I wasn’t as prepared for the piercing wind and frigid cold in downtown. I didn’t heed the advice of others to wear an old sweat shirt to stay warm. Big mistake. That hour of waiting in the cold corral was almost unbearable and felt as though it lasted an eternity. Waiting for the first 2 groups to start was a very long 15 minutes. The cold definitely kept my mind off of the next 5 hours and into the moment. So far, I was too frozen for anxiety to kick in. As we waited for group C’s pre-race ceremony (they completed one for each corral which was really cool), I quickly started to warm up and get ready to go. The fireworks started, the gun sounded, and I hit my watch to the “Go” position. I was off. I didn’t see my wife again for 5 hours. I did get to run with Smeeches for about a mile or so, but I detoured quickly at the first set of porta-potties. Then I was on my own: 5 hours and 26 miles alone with my thoughts. 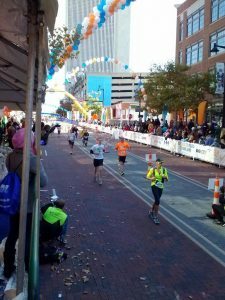 The marathon course took participants all over Columbus from downtown to Bexley to OSU Campus to Grandview. It was a great run and tour of the city. Many of the areas on the course I had never seen before, so that kept it exciting. There were only a few miles that were shared with the Cap City Half, so it was basically a whole new race for me. The first half of the marathon was awesome. Greeting the Patient Champions, reading the supporters signs, and hearing people you didn’t know read your name from your bib and cheer you on personally. The name on my bib was “jziggy” so this threw some people off. But it was cool. I did see some of my friends that were out cheering. I know I saw Andrea and Anne. There was more than one point that I heard people cheer me on by my real name so there must have been more people out there that I knew. At Mile 12, I started looking hard for Zoe and the in-laws. I was looking all over the place for 2 miles, but never saw them. At first I was disappointed. In hindsight, this may have been a good thing. I was starting to get so over run with emotion, I may have broken down. The half marathoners split off and I headed north for a 4 mile run up High Street. I was dreading this stretch. Maybe it was the gradual climb or the “been there, done that” that I wasn’t excited about. Maybe it was the stories of the “ghost town” after the half marathon split off. But I was dreading this part of the course. In hindsight, I’m not sure why I was worried about the run up High Street. I basically blinked and 4 miles where gone. The next thing I know, I am through the Short North, and on the OSU campus. As I turned off High Street on to Lane Avenue, I started to realize that I may need a walk and stretch break. I had hoped to hold this off until mile 20, but at 16 it was definitely time. I had just passed my first marathon victim being loaded into an ambulance and didn’t want to be next. At this point I recognized that for the most part, I had nearly continuously ran 16 miles without a break at an average 10 minute per mile pace. A break was necessary and justified. The course through campus was a serpentine, weaving in, out, and around a variety of buildings and landmarks. I was starting to get a little bummed out with my pace and was worried about my physical condition. With 10 more miles to go, I was really working on fumes. The Cliff Shot Blocks weren’t helping much and I was feeling very dehydrated. I was mad at myself for my decisions and actions the days leading up to the marathon. But I had to “Fight to Win.” I was well over halfway to the finish, just gotta keep fighting. After a water stop and seeing Ohio Stadium from the field perked me up a bit. I’m not a Buckeye fan, but that was a really cool experience to run through the end zone at The Shoe. What an incredible vantage point of the stadium. The trip into the stadium was a welcomed down hill. Sadly what goes down must come back up. Once the cameras were off, I made the decision to walk up and out of the tunnel. After a quick stretch and some high fives at a Patient Champions station, I was off again. Just before mile 19, I hit my first major crash. My legs were completely cramped and I was experiencing random pain from the tops of my knees to the tips of my toes. I spent much of the 18th mile stretching and walking. As I made my way through the Encore Mile (Mile 19), I was choked up at the signs with all the names of the Children’s Champions. Reading the names and looking for my own gave me a huge push. I was humbled and broke down briefly when I saw my name right next to the sponsors tent. It was an honor. The boost took me down the trail and kept me motivated for a while. Just as my body was screaming for taking another break, I realized I was at the 20 mile check point. Here there was a ton of people cheering and a lady reading off the names of the contestants as they crossed. What a major boost! This kept me very motivated and focused for about 3 miles. Although my pace had slowed, I was still running along. Thinking hard about many motivations. I was Fighting to Win. And was dreaming of the magical (maybe even mythical) banana stand that should be coming up. I remember thinking about all the people who were out in front of their houses handing out food and thinking that I wouldn’t touch that food. I joked with one family who was sitting out front drinking a case of Miller Lite. “Thanks for teasing me with beer” I said. To which one of them replied “here, take one!” What a comedian. Shortly after that thought, there was a lady offering me a popsicle and I had to talk myself out of taking it. I love popsicles. As I ran up a hill dreaming of popsicles, there it was: the magic banana stand! Ohh Kroger, thank you for your sponsorship and food. I ate as many bananas and oranges as I could. It was like a stoner eating a pizza, getting my banana and orange fix. My hands and mouth were incredibly sticky and this bothered me for the next mile. I finally couldn’t take it any more and used the water a the next water stop to cleanup. Rolling down those last 3 miles, I met up with the 4:45 pace group. The pacer was awesome and I credit her for keeping me motivated for 3 miles. I forged ahead of the group at one point when I saw a guy passed out on the ground with a frantic looking friend and a cop. Shortly after I recognized my heart was thumping hard and I fell back with the pace group. I forged on with a mile and a half to go. But as I turned on to Park Street, I was struggling and running out of gas. I definitely had hurt my knee and was a cramped mess. As I approached the North Market, the crowds got thicker and louder. My anxiety level was at its peak and I started to feel my throat close up. Struggling to breathe, I had to drown the crowd out. I knew if I saw Terri or Zoe that I would lose it. I had to go tunnel visioned and started to picture myself on a trail run. Out in the woods running down the Olentangy Trail by myself. It worked. Well, it worked until I had got to the finish line and heard Zoe call out “DADDY!” I barely crossed the finish line before I lost it. Cried like an emotional little baby right at the finish line. Click here to see my finisher video. I tried to compose myself as I got my medal and walked to get my picture taken. It was amazing. In that span of 5 minutes, I felt every emotion humanly possible. As I struggled up the stairs at McPherson Park (all 3 of the stairs), I walked toward the festival area to find my family. It was the most amazing feeling seeing them and knowing they watched me finish my first marathon. It was awesome to celebrate at the finish line with the support of Terri, Zoe, as well as my mother and father in-law. In hindsight, I made a few mistakes in my training and through my taper. Sadly, work efforts and life got in the way of training at the worst possible times. I feel my worst mistakes came from my diet and not sticking to my plan. I also wish I would have peaked my training closer to 26 miles. Ohh, and the pitcher of beer that I drank the night before probably didn’t help. Bottom line: I definitely have to stick to my training plan and diet. From what I have read, only between 0.1% and 0.5% of American’s have completed a marathon in their life time. Training for and running a marathon was the hardest and most rewarding physical experience I have ever undertaken. I am very proud to be a marathoner and cannot wait for my next 26.2 miles! PreviousWait a minute… I just lit a rocket. Rockets Explode!!!!!!!! I commented the other day and Im sad that it ate my comment! Anyway….so proud of you for finishing your first marathon! It may not have been your goal time, but you DID IT! Bask in the glory of the finish and I’ll see you on the trails soon!